LDUK would like to congratulate the charity Vis a Vis Symposiums on their second symposium which sounds as though it was a wonderful event! Thank you to Joanne Drayson, trustee of the charity, for this summary of the presentations. ‘I know one or two of you will be interested to hear how the Vis-a-Vis symposium went on Saturday, 1st October, 2016. Brilliant, is probably the best way I would describe it – by far one of the best conferences/symposiums I have been to on Lyme Disease in the UK. Perhaps the best bit was knowing there were doctors, consultants, researchers and veterinarians all listening attentively (and some taking copious notes) to the excellent presentations. Prof Hany Elsheikha, Veterinary Parasitology/Human/animal/Public Health from UK, gave an informative presentation, encouraging the audience to understand the clear and abundant presence of Ticks and the complexity of the numbers of pathogens they are able to transmit. The problems over testing and difficulties with diagnosis. Dr Jack Lambert Infectious and Tropical Diseases doctor from Ireland gave an outstanding presentation telling the audience the situation – how in other infectious diseases they acknowledged the limitations of testing and often treated empirically which is what he has been doing with considerable success with his suspected Lyme Disease patients. He talked about a study of 100 patients and how many had a good response to treatment in the just over 60% patients who chose to have the antibiotics or combination antibiotics he recommends (not everyone will opt for antibiotics, the patient has choices to make). It was so refreshing to hear so many positive comments about supporting this patient section. He also discussed a long list of suggested testing for a number of tick associated infections and immune markers plus the usual blood tests. Dr Carsten Nicolaus, Internal Medicine and Tick Borne Diseases from Germany, gave us the benefit of his vast experiences of treating Lyme and other tick associated diseases for very many years. He discussed testing methods and the need to support the immune system. My lack of detail on this talk by no means reflects the wealth of information he shared. Prof Perronne, Infectious and Tropical Diseases doctor from France, gave a brief rundown on the recent media/advocacy achievements resulting in certain promises to work with doctors and patients from their Health Minister. He then went into great details as to the complexities and why the need to treat empirically due to the many problems over testing, listing several studies that supported his statements and also several published studies he has done. He left the audience in no doubt of his views on the inadequacy of the IDSA (no longer listed) guidelines. 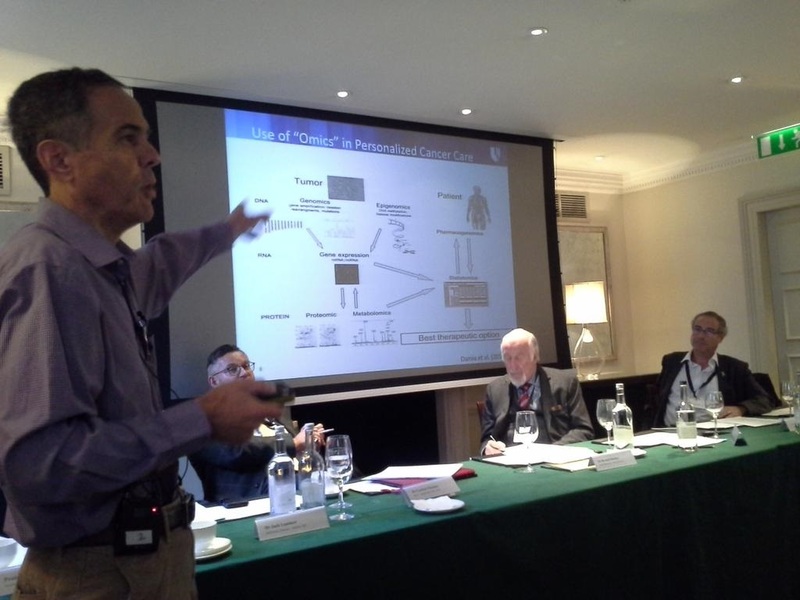 Prof Christopher J Matthias, Neurology/Autonomic & Cardiovascular research UK, gave a fascinating presentation on his specialty Autonomic nervous system problems, POTS and hyper mobility or EDS. He made sure the audience recognised he was not a Lyme specialist and wasn’t talking from that perspective, although he had had some patients who suffered both diseases or syndromes, he referred to Autonomic as a syndrome. 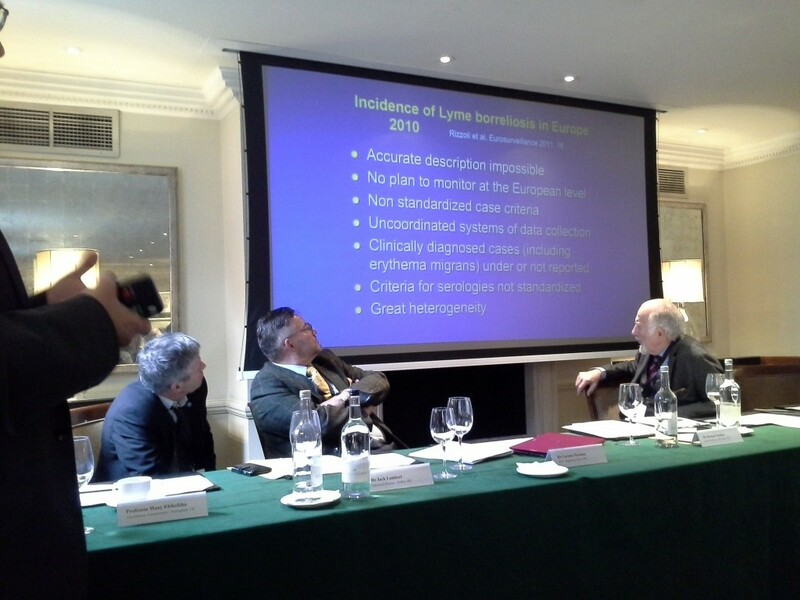 It was good he was there sharing his considerable knowledge for the benefit of all and hearing what the specialist Lyme doctors were sharing. Dr Bernard Raxlen, Neurocognitive & Tick-borne Diseases from USA, said much but in a much more subtle way. He showed a video of several of his patients talking about their experiences which so illustrated what many of us go through – going from very active young people to totally debilitating symptoms but with all the usual denial and labels we hear as Lyme patients from a shopping list of doctors. I hope it helped to illustrate that this is such a complex disease and can’t just be brushed aside, but doctors need to listen and work with their patients. Dr Neil Spector, Oncology, Author of “Gone in a heart beat”- a physician’s personal account of needing a heart transplant due entirely to a tick bite, from USA, well this was so very compelling, as a cancer researcher he was able to use his experiences to show how Borrelia and other tick infections mirrored many of the struggles experienced with dealing with many forms of cancer and how they had researched to move treatment options forward for cancer. No quick fix in cancer as they thought years ago, but lots of alternative ways to treat depending on the many types of cancer and so should it be with Borrelia. He touched lightly on his current work with a type of cancer and Borrelia, as this is yet unpublished, he wasn’t in a position to give much away, but watch this space and this was yet more mind opening information for our UK audience of doctors, researchers and veterinarians to hear. Lady Mar opened the Symposium and made some, as always, pertinent remarks. At the end she was encouraging UK doctors to continue talking to the panel doctors to help move the situation forward by sharing information. She gave one word of warning for the patients to pass along – beware of the MUS label, Medically Unexplained Symptoms because it equals NO treatment. She said having fought for years for patients with ME/CFS who had been treated badly (I think she was referring particularly to PACE but may be wrong) she wouldn’t want the same to happen to Lyme patients. All I can say now is BRAVO to Jocelyn Lees for making this all happen for the second time. Hopefully there may be videos available in the fullness of time for this latest symposium. Sincere thanks to all those presenting at the symposium giving up their time freely and travelling some distances to talk with our UK doctors, researchers and veterinarians. A sincere thanks to the many who attended this event and a hope it helps to stimulate thoughtful and productive investigations in this important field of human and animal medicine. Patient and Trustee of charity Vis-a-Vis Symposiums.